Over the last few months Google has alluded to the importance of a mobile friendly (responsive) design. Now we know why. In Google’s own words, “Starting April 21, we will be expanding our use of mobile-friendliness as a ranking signal.” Google will also “begin to use information from indexed apps as a factor in ranking for signed-in users who have the app installed.” That’s right — Google will once again shake up the Internet world with an algorithmic ranking update, and this time they’re giving us a warning. What does mobile-friendliness as a ranking signal mean? Google considers a multitude of different signals to determine the quality of your website. For instance, they look at your backlinks (or other sites on the web that link to yours). They use your content as a signal – is it fresh, unique, and high quality? They consider the technological soundness of your site – how easily can their bot and users can find and navigate your site? The list could go on, but the important thing to remember is that in addition to the factors mentioned above, Google will now be using mobile-friendly factors to help rank your site in mobile search results. 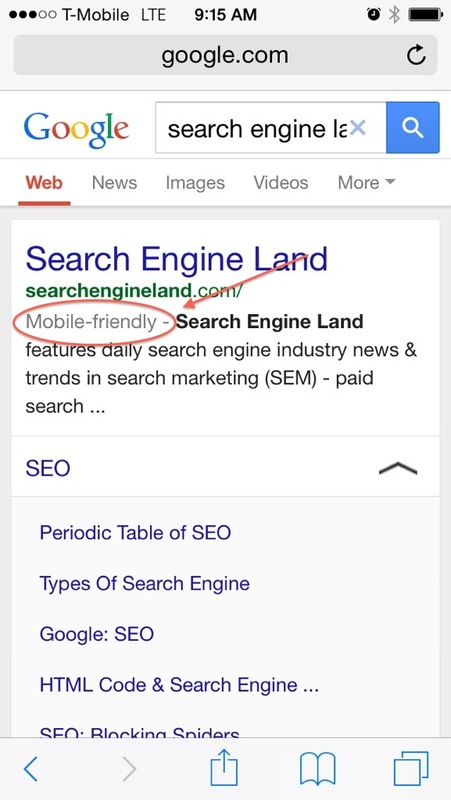 This means that if you want to show up well in Google’s mobile search results, and we know you do, it’s critical that you update your site to be mobile-friendly. Algorithm runs in real-time – we suspect this means that if your site is updated to be mobile-responsive, you could see an immediate bump in the search results. Page by page basis – if your home page is mobile friendly and the rest of your pages are not then only your home page will benefit. Why does Google care about mobile-friendly (responsive) design? Quite simply, Google cares about user experience (and you should too). Let me pontificate on the importance of this point. You should care how your customers (and, even more importantly, potential customers) interact with your site. If the user has to pinch, zoom, and drag your site all over their phone or tablet, they will not be satisfied with their experience. It may not be something you actively think about (I do because I’m an Internet nerd), but we’re all familiar on some level with the annoyance of a non-responsive site. According to a Local Search Association study released today (March 11th, 2015), “60% of US adults now typically choose smartphones or tablets over PCs to find information before buying products and services offline.” Creating a great mobile experience for the user can no longer be a second thought, but instead an integral part of design and development. What will this update mean for legal? Lawyers often fall behind the times on Internet and SEO best practices (possibly why we see such obvious spam in the industry). Legal is extremely competitive compared to most other markets (also possibly why spam is so prevalent in this industry). You can view this update as an opportunity to surpass your abhorred competitors, or you can view it as another Google-induced headache. Either way, it’s coming on April 21st and you can’t move out of the way. 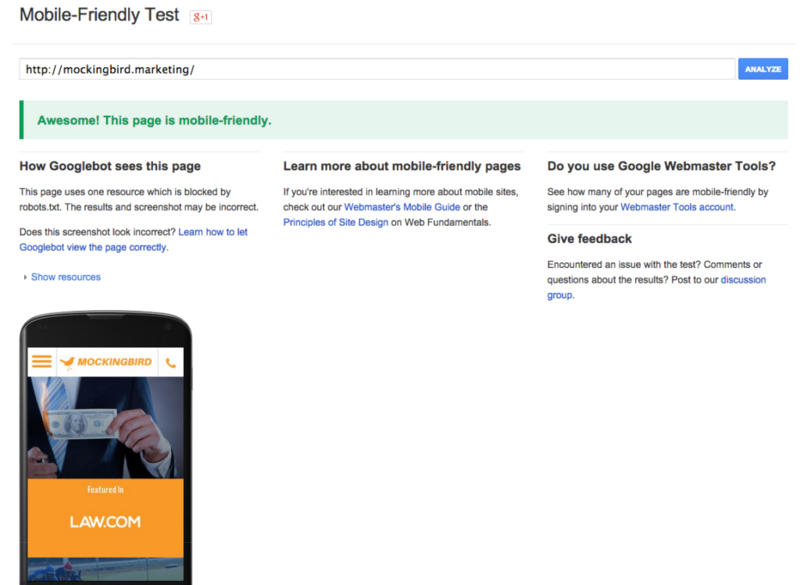 If you’re not sure whether your site is mobile-friendly, don’t worry; Google makes it extremely simple to test whether or not your site passes their test. You can check out your site in real time via Google’s “Mobile-Friendly Test”. You can see our actual result below. If you passed, congratulations! You need not fear April 21st. If you were greeted with a handful of red error messages, it’s time to seriously consider updating your site to be responsive to any device. Don’t get left behind in the extremely competitive legal landscape. If you need help avoiding the pain Google’s unmerciful hand, give us a call: 206-209-2125.